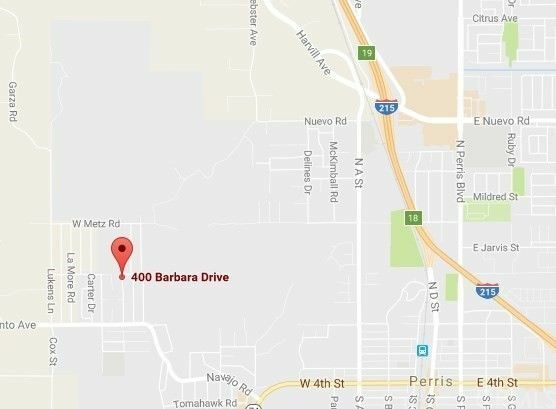 2.82 ACRES - consisting of 16 individual lots in growing Perris. Located in Riverside County, the fastest growing County in Southern California. Increased industrial and commercial development demands additional housing. Fronts on Barbara Drive (not in physically) on the East side. West side is backed by 16 occupied homes/mobile lots on Altura Drive. 1st lot fronts on Metz Road. Easy access from Metz or also San Jacinto to Barbara Drive. Lots average 80x100. Sewer and water available. Fire hydrant on Metz Rd & corner of Weston & Barbara Drive. Perris High School 1.5 miles to Nuevo Rd., Enchanted Hills, Park and Perris Elementary .5 to 1.3 miles. Good size parcels for development. Family area North of Highway 74 and West of the I-215 Freeway. Hold or build! Investor or developer opportunity! Have: Sewer, power & water available.